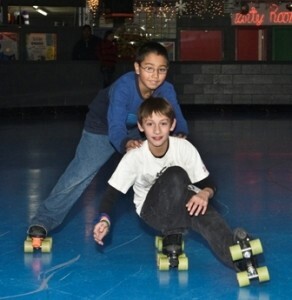 Rollerland isn’t just a skating rink, we’re also your source for the best parties in Fort Collins! We are a family business whose goal is to provide good, clean fun for all ages. If you are looking for a unique party venue in Fort Collins, you’ve come to the right place! Your guests will love roller skating to the best music with a live DJ at every skate session, challenging themselves to our Laser Maze, exploring our indoor playground for kids, and playing arcade games for tickets to redeem at our prize counter. Of course, no celebration is a complete without pizza! We also serve nachos, corndogs, hotdogs, pretzels, chicken nuggets, french fries and Pepsi fountain drinks. The possibilities are endless, so get in touch with us to start working on your group event today at 970-482-0497 or online. You can also easily book public and private birthday parties online!